In February 1942, U.S. armed forces defend Los Angeles from unidentified flying objects. Seventy years later, the alien invaders return to finish the attack. The new breed of U.S. armed forces face the aliens as they try to take over Los Angeles and end the rule of humanity on Earth. With the help of seasoned fighters from Second World War and betrayal from humanoids, aliens wish to colonize the Earth and end human existence. Sounds familiar? Maybe the individual elements do. But considering how these different kinds of awesomeness—the US military, hostile beings from outer space, and WWII vet—are packed into one film, this movie’s a great way to get an action flick fix, satisfying the movie buff’s thirst for various kinds of action. 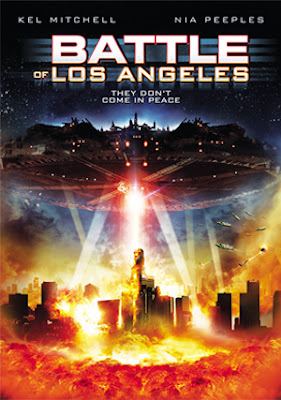 Distributed by The Asylum in 2011, Battle of Los Angeles is released with the tagline “They don’t come in peace.” Starring Kel Mitchell, Nia Peeples and Theresa Jun-Tao, Battle of Los Angeles was followed by War of the Worlds 2: The Next Wave.